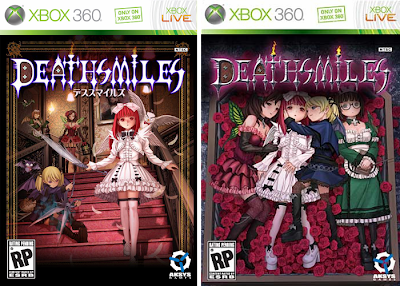 June 29 is a big day for North American fans of bullet-hell shmups (aka manic shooters), as it is the day the Cave-developed DeathSmiles hits store shelves in the States courtesy of Torrance, Calif.-based Aksys Games. Why is that such a big deal? Well, for starters, the side-scrolling DeathSmiles is the first Cave-developed, console-based shmup to be released in the region. Anyway, the folks at Aksys Games recently revealed the box art that will be used for the North American version of the game (below, right) and--surprise, surprise--it differs from the art that appeared on the Japanese release (below, left). Although I like the loli-lesbianism on display in the North American box art, I (slightly) prefer the drama and movement of the Japanese original. I don't particularly love either one, honestly. They don't seem to convey any sense of the type of game you described...but if I was going to pick one, it's be the Japanese version. 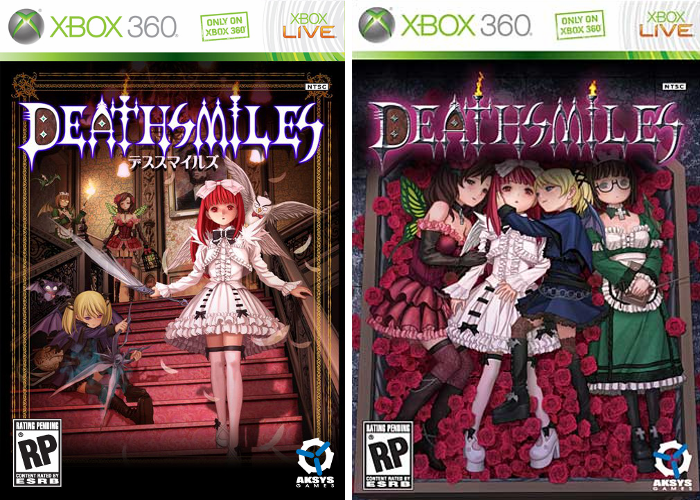 Well, to be fair to the folks who created this game, it does have a fairly gothic vibe to it, and the four girls shown on the cover are the game's main characters. Still, like you said, you probably wouldn't know it's a shooter unless you flipped it over and looked at the screenshots.